On a weekly basis, I reckon I get through around four packs of Jammy Dodgers, at least. To me, dipped in a hot cup of tea, the Jammy Dodger is king of the biscuits. All hail the mighty Dodger, bow down to its supreme jammyness! We’ll not discuss those disgraceful pretenders to the throne though…. I’m looking at you, banana and toffee horrors! During my last tea and biscuit break I was sat, Dodger in hand, staring wistfully into space when my gaze landed upon a pile of white chocolate blondies. I should mention at this point that I was at work, I don’t just have piles of baked goods surrounding me at home. Honest! When it struck me, Jammy Dodger white chocolate blondies! What’s not to love?! A creamy white chocolate blondie, swirled with sticky strawberry jam and topped with my very favorite biscuit. Get in! I seriously can’t even begin to get over how cute they turned out. I must have shown the steaming tray to everyone who came into the shop that afternoon, eardrums may have been pierced from my high pitched squeal of ‘aren’t they just so goddamn canny? !’ Imagine them on a mad hatters style tea party, I don’t think I could bare the cuteness. Preheat the oven to 175C. Grease and line a 9×13″ baking tray or use a disposable one. Melt the butter and white chocolate in a large, heavy bottomed saucepan over a low heat. Stir constantly until smooth and melted. In the bowl of an electric mixer add the sugar and eggs and mix until combined and light, pour in the melted chocolate and mix thoroughly. Add the flour and stir in by hand until just combined. Pour the batter into the prepared pan. Drop teaspoons of jam over the blondie batter and use a sharp knife to swirl through. 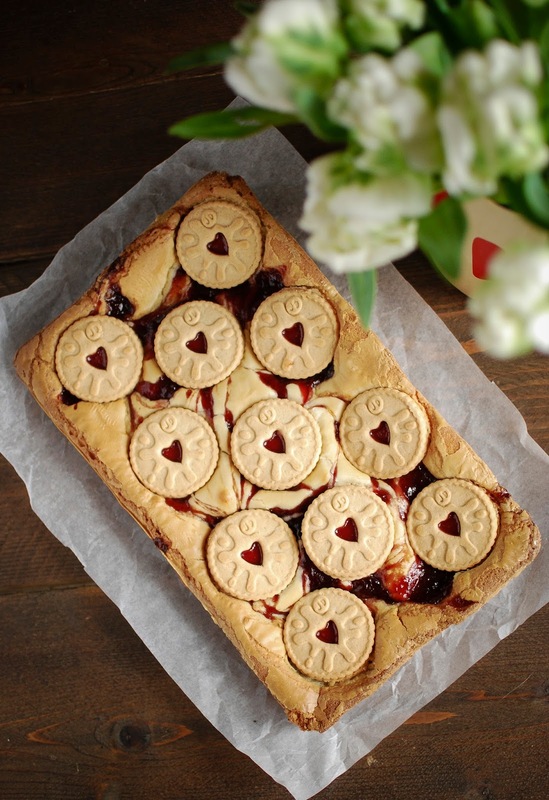 Place the Jammy Dodgers on top in a neat pattern and bake for 25 minutes until just set. Allow to cool completely. Cut into 15 squares and enjoy. These look so adorable! I do love a jammy dodger, I buy the mini snack packs for Zoe when we are out and about. How scrummy! 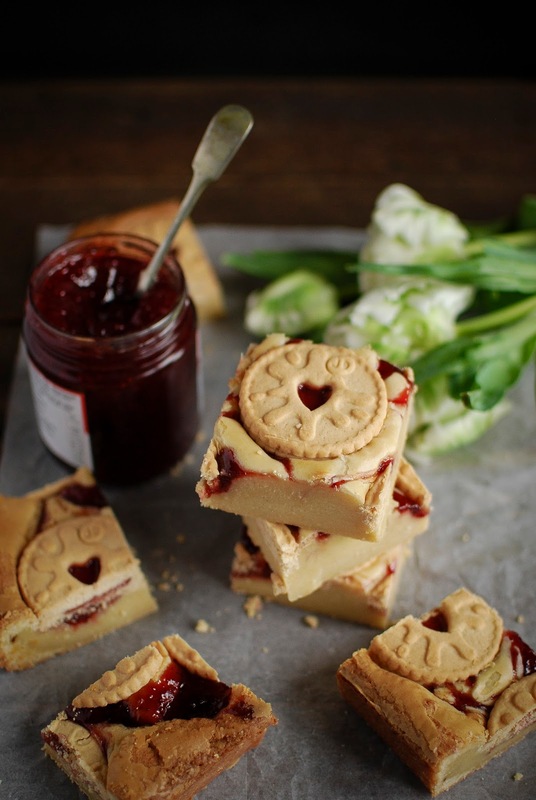 My hubby loves Jammy Dodgers so this may be an essential Easter treat. Fab recipe! Hi,regarding the recipe it says mix the eggs and sugar until combined and light. How long do I mix them for as I am not sure? I’ve tried this recipe twice and on both occasions the batter has rufused to cook. The first attempt was a huge failure which was on me due me not having the correct size of tray so it came out burnt on the out side and uncooked on inside. The second time I tried I was able to acquire The correct size tray but again it came out uncooked. I have followed the recipe closely and have done everything the instructions have told me but the mixture still won’t cook on the inside. I left in a 175c fan oven for over 30 mins and it still wouldn’t cook. Sorry you’re having problems with this recipe. The batter will look like it’s uncooked when it comes out the oven (still wobbling) but will set once it cools down. If your batter is still undercooked simply extend the cooking time by 5 minutes at a time, if the top begins to colour a little too much just cover it with some tin foil. I love this recipe, works very well for me. I’ve also adapted it for my nutella and forrero rocher blondies, and my lotus biscoff blondies and it works every time. The only think I would say is because it has the jammie dodgers on top, it does need a little longer baking as when you cut it the biscuits can make it harder and the blondie can come out quite squidgy.